Cash Grab Classic Slot Guide & Review - Casino Answers! Cash Grab is a 3-reel, 1-line classic slot machine developed by Vegas Tech, featuring wild symbols, multipliers and a bonus game. 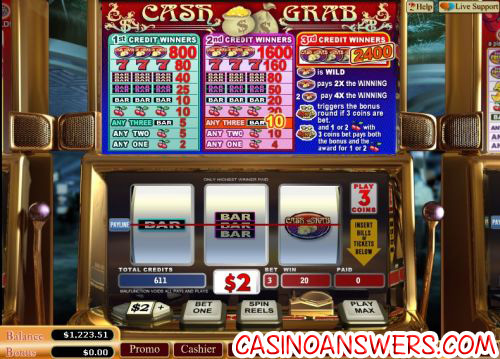 You can play the Cash Grab slot machine game at US-friendly online casinos Go Casino and Millionaire Casino. Bets on the Cash Grab bonus slot machine include $2, $5, $10 and $25. You may use “Bet One” and “Play Max” to bet between 1-3 coins per spin. You can also click on the paytable to choose how many coins (or credits) you wish to play. Casino Answers recommends playing all 3 coins to enable the game’s special features as well as the top jackpot. Playing 3 coins will give you the most value playing Cash Grab. The lowest total bet you can make on the Cash Grab slot game is $2 per spin. The highest total bet you can make on a spin in Cash Grab is $75 per spin. Cash Grab is best-suited for high rollers. To play Cash Grab, press the “Spin Reels” button. To win the 2400 coin top jackpot on the Cash Grab 3-reel slot machine, you must play all 3 coins and hit 3 Cash Grab symbols. The Cash Grab symbol is wild and will substitute for all other symbols. 1 Cash Grab symbol will act as a 2X multiplier when completing winning combinations, whereas 2 Cash Grab symbols will act as a 4X multiplier. When playing the 3-coin maximum bet on the Cash Grab slot machine, you will enable the Cash Grab bonus symbol. When it appears, you will trigger the Cash Grab bonus game. If the bonus symbol appears alongside Cherry symbols, you will be awarded the prize for the Cherry symbols in addition to triggering the bonus game. The bonus game is a very simple “Pick ‘Em” game. You will have a choice of 9 Money Bags. Pick one and you will win a prize (listed in dollars). The bonus game will then give you the option of accepting your prize or trading it in for another one. You must accept the second prize. The Cash Grab bonus game is the quickest way to grab cash while playing at Go Casino. There are 9 winning combinations on the Cash Grab slot game. They include (1/2/3 coin payouts in parenthesis): 3 Cash Grab symbols (800/1600/2400), 3 Seven symbols (80/160), 3 Triple Bar symbols (40/80), 3 Double Bar symbols (25/50), 3 Single Bar symbols (10/20), 3 Cherry symbols (10/20), any 3 Bar symbols (5/10), any 2 Cherry symbols (5/10), any 1 Cherry symbol (2/4). Unless listed, the 3-coin payout is identical to the 2-coin payout. 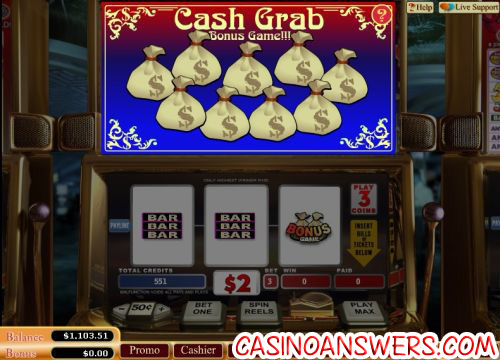 Cash Grab is an excellent high roller slot machine, offering not only a regular slot game, but a bonus game as well. Not only can you play Cash Grab, but you will also receive up to $20,000 in bonuses plus 4 free slot tournament tickets upon signing up at Go Casino! Can American players play the Cash Grab slot game for real money? Slots players based in the United States of America are welcome to sign up, deposit and play the Cash Grab slot machine for real money at two of our favourite Vegas Tech online casinos, Go Casino and Millionaire Casino. Where can I play a Flash game of Cash Grab for free? You can play an Instant Play version of Cash Grab for free or real money at Go Flash Casino and Millionaire Flash Casino. Absolutely no download is required! If you have problems with the Flash casino software, try downloading and installing the latest version of Adobe Flash Player. How do I win the top fixed jackpot on Cash Grab? To win the Cash Grab fruit machine’s top jackpot of 2400X your coin bet, make sure to use the “Play Max” button while playing. If 3 Cash Grab symbols appear on the payline, you will win 2400 coins! How much can I win on the Cash Grab classic slot machine? If you are making the maximum total bet of $75 per spin on Cash Grab, you can win $60,000 if you hit the top jackpot! Is there a progressive jackpot on the Cash Grab slot machine? Cash Grab does not have a progressive jackpot. For information on a progressive jackpot slot machine that you can play at Vegas Technology casinos like Go Casino, please read our Red, White and Win Progressive Jackpot Slot Review. How do I get to the bonus game on the Cash Grab bonus slot machine? To enter the bonus game on Cash Grab, all you need is one Bonus symbol that will appear on the third reel. What casinos have the cash grab classic slot machine? What is a good fruit machine type slot with a great bonus game?